The large order of scallops. 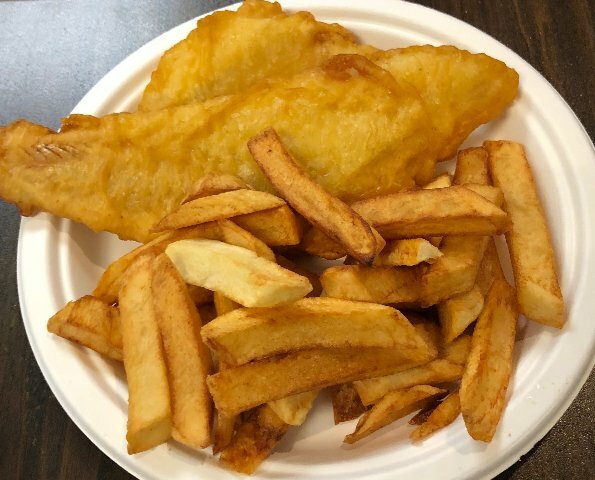 The small size fish and chips. For spring cleaning, to dust off winter cobwebs, we will spend a week in Edinburgh and another in London. 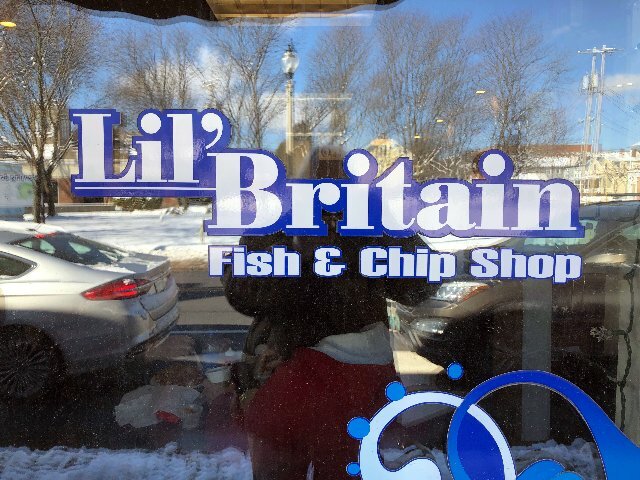 To get in the mood we had a cozy, comfort food lunch at Lil’s Britain in Bennington, Vermont. It’s on the main drag through town at its four corners intersection. There was colorful signage on the window welcoming us in. 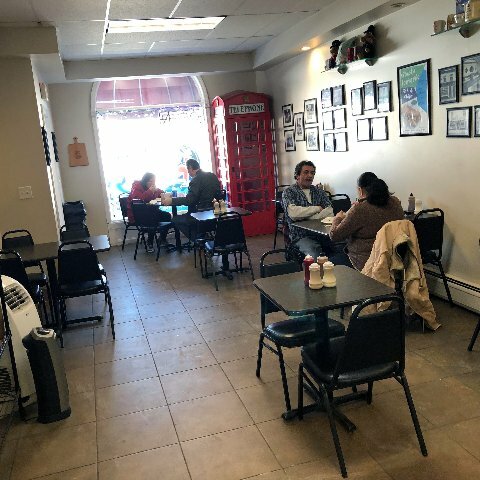 Other than some framed photos on the walls, and an iconic red phone booth in the corner, there was nothing artsy fartsy about the décor. 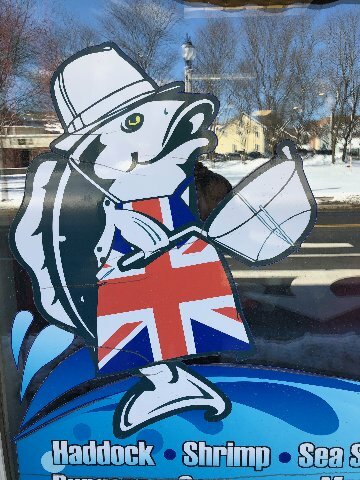 In every sense it was a regular, unpretentious little fish and chips shop. Being our first visit Astrid had the straight up small order of fish and chips ($8.95). 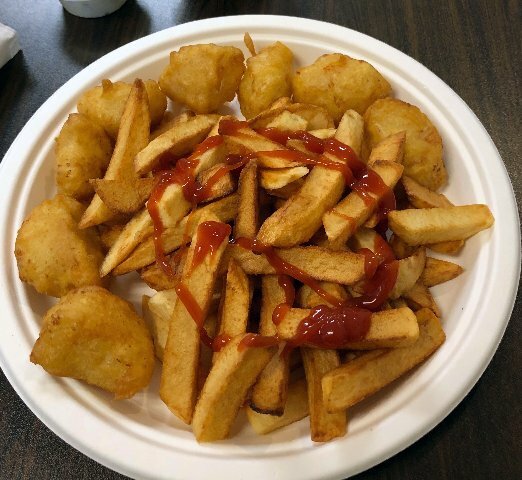 She is allergic to scallops but I seized on the opportunity and ordered the large portion at $14.50. There were just enough large sea scallops. I also love the scallop sandwich ($12.95) at the Highland Restaurant, 100 Fenn Street, in Pittsfield. They serve smaller, nutty and more briny scallops. It’s the go to item on a generic Italian menu with throwback 1950s food and décor. But their scallop sandwich, generous for the price, puts me in orbit. 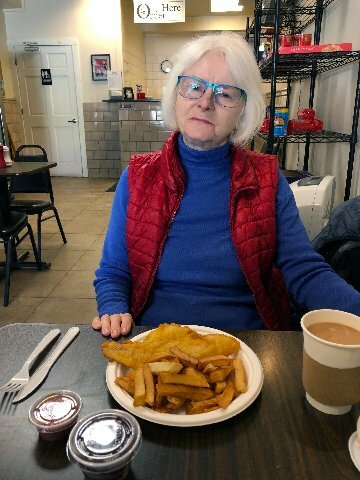 Her order was more than adequate with three pieces of fish. The batter was nice and flaky. And my scallops were terrific. The chips, however, were garden variety French fries. There was malt vinegar on the table but they were not like the chips I remember from London. They wrap it in newspaper like a cone and I had chips with me mate on a park bench. It was after the pubs close which is way too early for last call. The Brits are most peculiar about pub hours. But there’s nothing like hunkering down with a pint or two, or three, or four. Well, actually, not like before. One will do nowadays. Thank God they don’t smoke anymore as pubs have become gasp proof. While serving great food for cheap prices the joint isn’t large on character and charm. It was fairly busy for mid winter and everyone appeared to be regulars. A bloke dropped in for takeout. Perusing the menu we vowed to be back for bangers and mashed with peas. The steak pie at $6.00 looks tempting. The cook informed a costumer that it takes 25 minutes or you can call in the order in advance. I might try that and can always watch Netflix on my I Phone while waiting for a pie. They offer several. 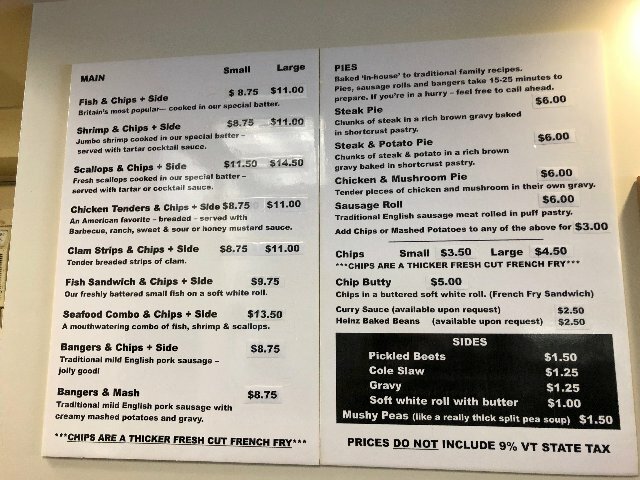 When passing through Bennington this is our new go to joint for cheap eats.